An environmental consulting company tasked with investigating a plan by the government to construct a new port at Lüderitz says the proposal should not be approved because it is a severe threat to the environment and historic sites. The Namibia Ports Authority (Namport) has been planning construction of a new harbour in the southern coastal town in recent years, partly because the current port is being used beyond capacity. The parastatal said on its website that the proposed new harbour, named Angra Point Deepwater Port, could also be used to export phosphate, which would be extracted from the ocean near the town. Namport wants the new port to be constructed in the Tsau //Khaeb National Park (formerly known as the Sperrgebiet), inside the Namibian Marine Islands Protected Area. The protected area consists of one million hectares of marine and sea area, with 10 small islands and eight islets or rock outcroppings providing sanctuary to a variety of marine and bird life. The proposed extraction of phosphate from the Atlantic Ocean floor to produce fertilisers attracted criticism from the public and some political leaders. 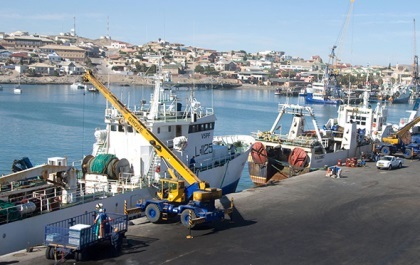 Namport said the plan to build a new port was put on hold due to the lack of environmental research and final clearance from the government. In the meantime, the company, which is in the process of updating its long-term ports development plan, asked environmental consultancy firm Geo Pollution Technologies to carry out an environmental assessment for the proposed port. The assessment aimed to determine the impact of the project on, amongst others, the environment, to enable decision-makers and affected people to make informed decisions regarding the project. Geo Pollution Technologies, widely known for producing the environmental assessment for President Hage Geingob’s private elite township, recently released its report, in which it warned Namport that the proposed port is a risk. ‘Based on the scoping assessment, it is the opinion of Geo Pollution Technologies that (the) port development at Angra Point, and any other future sacrificial developments that may be considered for this area, should not be allowed,’ the report said. The environmental firm said the Angra Point peninsula is an ecologically sensitive area as it falls within the area known as the Succulent Karoo Biome, which is recognised by the United Nations Educational, Scientific and Cultural Organisation (UNESCO) as a biodiversity hotspot, and is the world’s only arid hot spot. According to UNESCO, the area is home to over 6 350 plant species, 121 reptile species, 68 mammal species and 431 bird species. Excluding new roads and railway lines as well as the effects of a decrease in natural habitats and deterioration, an additional 9.6% of this habitat will be destroyed by the port development, Geo Pollution Technologies warned. ‘It supports some mammals, among them the brown hyena, a near-threatened species,’ the environmental report stated. Also, the report said, the avifaunal diversity (birds of a particular region, habitat, or geological period) is high, and that the marine environment supports some marine mammals of importance. The report said archaeologically, the project location is of interest due to, amongst others, the presence of World War I trenches, an old whaling station, and the possibility of the presence of shell middens and other signs of early human habitation. ‘Detailed information regarding the archaeology of the area is insufficient, and an archaeological assessment of the project area and immediate surroundings is recommended,’ the report added. Presently, Angra Point hosts a significant number of the few bays and sandy beaches available for locals and visitors for recreational purposes such as bathing, diving, fishing and rock lobster harvesting,’ Geo Pollution Technologies said. The experts admitted that the proposed harbour provides some benefits such as job creation, skills development and education. ‘Although the proposed Angra Point Deepwater Port will present definite benefits and opportunities for the local community, the environmental impacts are of significant concern,’ the report noted. Based on current policies and the project location, additional specialist studies also need to be done to gain in-depth knowledge about the environment. The government has for many years been looking at constructing a third port as Namibia has only two harbours, one at Lüderitz and one at Walvis Bay. The other option that the government has since independently been looking at is constructing a harbour along the Skeleton Coast at either Cape Fria or Angra Fria. The government proudly advertises the Skeleton Coast, which is situated alongside the Atlantic Ocean, as one of Namibia’s greatest treasures as it contains more than 100 species including desert elephants, rhinos and lions. Other features of the Skeleton Coast include beaches, dunes, riverbeds, canyons and a variety of vegetation. Namport advertised a tender in 2015 to have a study conducted for the proposed port at Cape Fria. Media reports said the construction of the port could likely cost around N$10 billion. It’s unclear what the status of that project is. Government officials told The Namibian last year that the matter was with the works ministry.